Most popular from the Voodoo-cult of Haiti in which the dead is reanimated and don"t feel pain. Zombies have existed for hundreds, perhaps thousands, of years, in the form/brought of magical or religious ceremonies which raised the dead. Modern zombology did not take form until about 1912. In 1912, Dr. Otto Standish, known as the Father of Modern Zombology, published "Mechanisms and Characteristics of the Undead", a treatise which raised zombology from the level of folklore and myth to a science. Dr. Otto Standish spent several years in the field studying the Voodoo rituals which produced the undead, and their effects on undead physiology. Alien Zombies (Zombus Xenus) This species of possessed zombie is typically used by aliens as a means of warfare. The body is either inhabited by an alien intellect, or controlled indirectly. Biological Zombies (Zombus Biologicus) These zombies are re-animated by some form of chemical. Application of the chemical restores some basic brain functions, and occasionally memories of previous lives. Zombies of this type appear to have suffered some sort of mental defect which pre-disposes them to misanthropy and cannibalism. There is a variant of Biological Zombie where the re-animation is introduced through a disease-bearing pathogen of some sort. In these cases, anyone who has caught the pathogen will become a zombie after they are dead. Sometimes the pathogen affects the living as well, causing them to act aggressively toward noninfected people similiar to the movie, "Night of the Living Dead". Demon Zombies (Zombus Demonicus) This species of possessed zombie behaves under basically the same principles as the Alien Zombie, except that the intent is usually more malicious and evil in nature, with no clear purpose other than to cause suffering on the living. Electrical Zombies (Zombus Electricus) This re-animation of this rare species of zombie is brought about by applying a large electrical charge to a corpse. Bolts of lightning provide sufficient charge, but there are further intricacies involved which have prevented this type of zombie from being common. The only persons able to reliably produce Electrical Zombies were Baron Frankenstein and one of his descendants. Zombies (Zombus Atomicus) Radiation has also been known to restore basic brain function to corpses. The resulting zombie is very similar to the Biological Zombie. There are those that argue that these two zombie types are the same species, and that the manner of re-animation is irrelevant. This continues to be a divisive issue in zombology today. 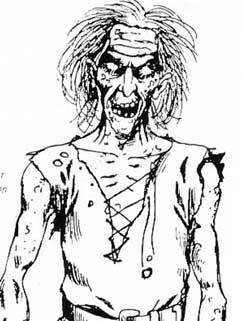 Satanic Zombies (Zombus Satanicus) These zombies are re-animated by powers that are satanic in origin, such as from a ritual read from a book of dark magic. They are distinct from Demonic Zombies in that these zombies have self-will, and are not merely possessed shells. They are typically malevolent in nature. Those who cast the spell of re-animation are sometimes in control of the zombies, but more often than not, the zombies merely awaken and begin wreaking havoc. Voodoo Zombies (i) (Zombus Caribbeanus Mortis) Zombies from this species are closely related to Satanic Zombies. Magic is still used in the re-animation process, but the power stems from a human agent who has much more control over the zombies after they come alive. For those who wish to produce zombies, this has been established as the most effective method, simply because the zombies will almost always do the bidding of their creator. Voodoo Zombies (ii) (Zombus Caribbeanus Vivus) There is a variant of Voodoo Zombie where the zombie is produced from a living person, usually through the forced consumption of mind-destroying drugs. These zombies are relatively useless in combat, since they are both slow-moving and can be killed like a normal living person. For menial household chores, though, they are quite useful. The Zombie demon is a male demon.